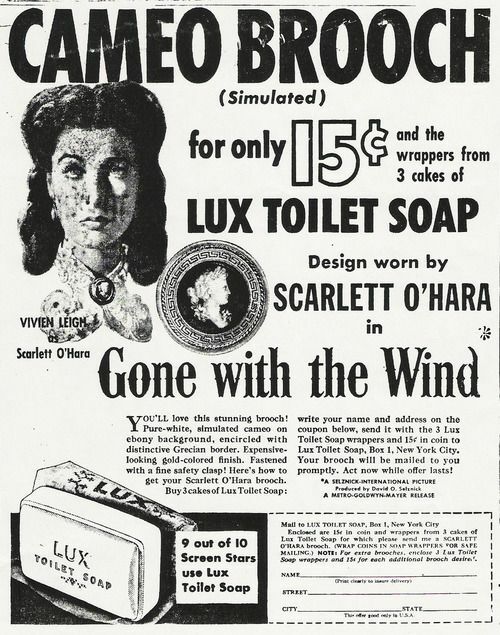 My mom and I listened to His Girl Friday starring Claudette Colbert, Fred MacMurray, and Jack Carson a few days ago, and they were advertising the hell out of their current–current to the 40’s, I mean–promotion, this ridiculous Scarlett O’Hara brooch. I’ve heard them advertise it before, but this time we looked it up. This is like the 1940s version of fangirl behavior. Everyday fangirl wear. I’m really tempted to look up all the weird cereal box prizes Lux ever offered, but it’s kind of fun discovering them one by one. I’ve always wanted a decoder ring too. Sadly I don’t think they accept the wrappers any more.